Breathtaking beauty sweeps Santorini's dazzling landscape with swoon-worthy elegance. Between black-sand beaches, iconic blue domes and fragrant pink bougainvillea lies the island's infamous white-washed villages. Sitting pretty on charming clifftops – the sugar cube dwellings are seemingly perched at the edge of the world. Townscapes turn to seascapes, and fade into a mesmerising abyss of brilliant blue. A true once in a lifetime holiday, you'll want to make the most of every magical moment! Here's our inside tips for the best things to do in Santorini. Like so many of the gorgeous Greek islands, Santorini packs a punch when it comes to natural beauty. Even its towns are dripping in nature's best handiwork, with beautiful bougainvillea dressing up doorways and balconies flawlessly with bright pink florals. In fact, the hillside hamlets are so jaw-dropping it's almost impossible to tear yourself away from their seductive streets and alluring alleyways. If you manage to, you'll find yourself rewarded with hidden hotspots and off-the-beaten track treasures. From beaches to rocky headlands, there's countless natural creations to uncover and explore. Rising from the Aegean Sea like something out of Greek mythology, the mighty Skaros Rock is a stone's throw from the town of Imergovigli. Once home to a castle, you can still see the scattered remains left by a destructive earthquake that struck the area. Paths zig-zag up and down the craggy coastline and the hike is breathtaking from start to finish – and that's not just because of the steep incline! Dazzling views unfold in all directions. Steep, multi-coloured cliffs dominate the landscape and plunge into the caldera below, whilst wildflowers line the path with a kaleidoscope of colour. 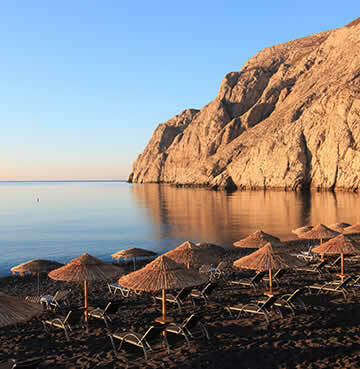 Once you reach Skaros Rock, sit and enjoy the unbeatable views of the volcano, cauldron-like caldera and nearby islands. Cameras at the ready for this one! Beaches aren't necessarily the first thing you think of when holidaying in Santorini, but they're most definitely worth a visit. Quirky in all the best ways, the island's beaches are wonderfully wild and rugged, just as nature intended. Red Beach is famed for its distinctive hues and scenic setting – and yes, it really is that colour! Surrounded by steep hills and enormous volcanic rocks, it's almost impossible to believe the contrast of turquoise waters and red everything. For a more mainstream offering, head to captivating Kamari. Nestled at the foot of Mesa Vouno Mountain, the Blue Flag beach is made up of black sand that runs for a whopping 5km in length. Families in particular favour these stunning shores, not least because there's a whole host of handy facilities, eateries and watersports to boot! Proof you should never judge a book by its cover, Thirasia Islet may be small, but there's a lot to get stuck into! Best explored on foot, follow pathways that'll lead you beside sleepy villages and luscious landscapes. The views from the idyllic islet are pure Mediterranean magic, with hypnotic views over the caldera and stunning Santorini. Relax by characterful bobbing boats or jump aboard one for a visit to the Geological Park of Nea Kameni. Here you'll be able to hike the volcano as well as taking a dip in the heavenly hot springs. Santorini's world-famous whitewashed houses are one of the island's most defining features. Carefully carved into craggy clifftop, the sugar cube residences are interspersed with vivid blue domes and fuchsia florals. Narrow streets meander like a magical maze through shops, tavernas, cafés and sun-drenched terraces – and there's not a bad view in the neighbourhood! Oia's enchantment is brought to life with light. Morning beams spill over the village with beautiful brilliance, bathing everything in warm golden hues – and that's just the warm up act. White houses dazzle and pop against the deep blue sky and waters of the caldera, with every turn offering a picture-perfect scene. 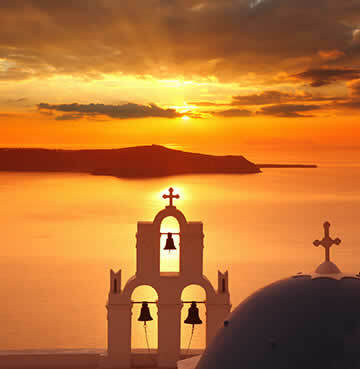 Days melt into evenings, and the splendour of Santorini's sunsets are unrivalled. A blaze of colour shoots across the horizon, and once again the little town glows gold. Paradisiacal panoramas and heavenly hues are one of the island's worst kept secrets, but nothing compares to experiencing them with your own eyes. 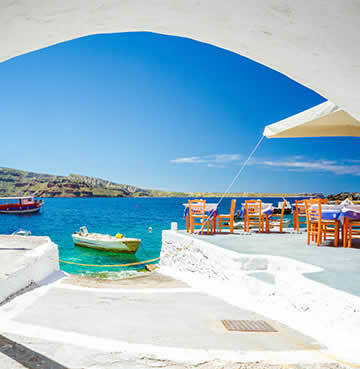 Amoudi Bay lies 300 steps below Oia, at the island's most north-westerly tip. The majestic marina seems almost undetected compared to the town above – welcome to your personal slice of Greek island paradise! Feast your eyes on the iridescent blue and green waves playfully lapping the port's shore, and watch as fisherman's boats bob gently on the water. There's a small number of restaurants that serve up the freshest dishes and catches from the day, making it a blissful spot for a balmy evening dinner date. Just 11km from out-of-this world Oia lies the capital of Fira. Boasting the same iconic whitewashed exteriors, there's also colourful corridors of high-end shops, cafés and souvenir stalls. Saunter through scenic alleyways and bask on beautiful balconies while enjoying breathtaking views over the caldera. Natural beauty meets nightlife and you'll be spoilt for choice with romantic restaurants and buzzing bars – holiday harmony at its finest. 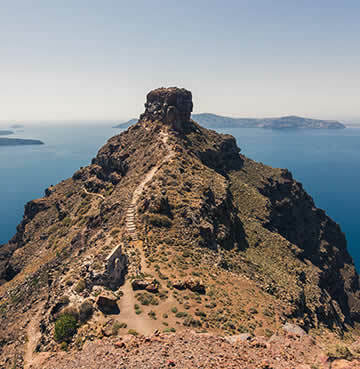 History buffs can get stuck in to Santorini's dramatic past with a visit to Fira's two museums. Housing treasures excavated from the Bronze Age settlement of Akrotiri, some of the finds date back as far as the 17th Century. The volcanic ash that devastated the ancient city is also what preserved it so pristinely for present-day archaeologists to discover. Now displayed for all to admire at the Santorini Archaeological Museum and Museum of Prehistoric Thera, you can wander through relics, sculptures, ceramics and carvings from different times in the island's history. Oia and Fira wouldn't be the same without their infamous architecture. Officially called Yposkafos, it's thought locals built these houses into the volcanic rock as early as the 7th Century, carving their living quarters into caves. And voila! The iconic clifftop nestled villages were born. Domes are dotted around in all shapes and sizes, belonging to traditional churches and chapels that have stood for centuries – their bright blue popping against whitewashed walls – mimicking the colours of the Greek flag. Theoskepasti Chapel is a quintessential symbol of Santorini, which you're sure to stumble upon when visiting Imerovigli. Picture-perfect, it sits elegantly in front of the glittering sea with sensational views sprawling out left, right and center. Stunning sunsets are Santorini's trademark. Church silhouettes and whimsical windmills sit against an orange sky, and Mother Nature pulls out all the stops for her mesmerising masterpiece. Oia and Fira are both traveller favourites, but there's plenty of other quieter spots to take in the show if you're after a more intimate setting. Journey out to the caldera on an evening cruise and watch the golden light glisten on the calm waters. Marvel at the rugged coastline and clifftop hamlets as they bask in the last few moments of sunlight and savour every last second of spellbinding stillness. If you're after a higher vantage point, then head to the hillsides outside of Oia. Pack a picnic blanket and you're all set for an unforgettable evening of skyline spectating without the crowds. 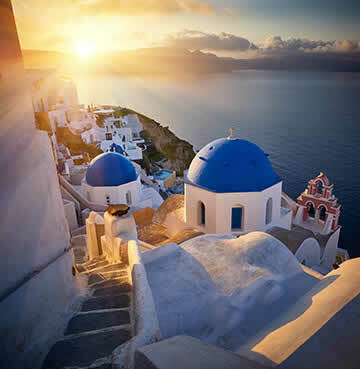 It's easy to see why Santorini's reputation precedes it when it comes to sunsets – and deservedly so. A Greek go-to for holiday high-living – Santorini is every bit as enchanting as you'd imagine. Couples will find themselves weak at the knees with the island's natural beauty and romantic backdrop, while families can get their action and adventure kicks through exploring on ATVs, quad bikes and scooters! One thing's for sure, the otherworldly views and spellbinding sunsets will seduce everyone.